Interim WBA super middleweight champion Vincent Feigenbutz (21-2, 19 KOs) fell apart tonight in getting beaten by 31-year-old Italian Giovanni De Carolis (24-6, 12 KOs) by an 11th round technical knockout in their rematch at the Baden Arena in Offenburg, Germany. De Carolis, #14 WBA, unloaded on the 20-year-old Feigenbutz with a series of power shots in the 11th round to get the TKO victory. The fight was stopped by referee Gustavo Padilla at :32 of the round. Feigenbutz probably should have taken a knee to try and clear his head after getting hurt, but he was too out of it to think clearly. Feigenbutz fought like he wasn’t thinking too clearly from the 1st round, as he let the fight get out of hand early with De Carolis getting off to a big lead in the first half of the fight by simply being the busier fighter. Feigenbutz came back a little bit in the 2nd half of the fight in throwing some nice power shots that connected. He was fighting more for survival at that point. 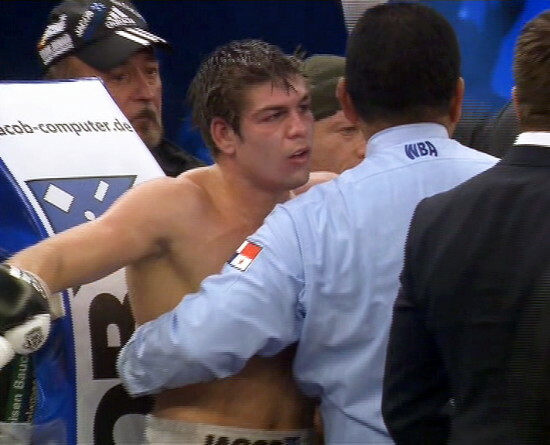 20-year-old Feigenbutz was not ready to be fighting at this high of a level, and he arguably should have never been the interim WBA belt holder in the first place. The win means De Carolis could wind up facing WBA super middleweight champion Fedor Chudinov in the near future. That has the makings of a mismatch, because Chudinov appears to be a much better fighter than De Carolis. Feigenbutz needs to go back to the drawing board. He would be better off fighting in the amateur ranks than as a pro, because he’s too unskilled for him to be mixing it up against professional fighters from the 1st tier. In a mismatch, 32-year-old heavyweight Dereck Chisora (25-5, 17 KOs) defeated Andras Csomor (14-9-1, 12 KOs) by a 2nd round stoppage. Csomor did not look good in there with Chisora, and the fight could have been over in the 1st round if Chisora had wanted it to. Chisora is putting together a lot of victories with Sauerland Events. He needs to step it up against better opposition soon though because he’s wasting his career on lesser fighters. I see no improvement in Chisora from the fighter that was stopped by Tyson Fury two years ago. Chisora just looks a little older.